Leider ist der Eintrag nur auf Amerikanisches Englisch und Čeština verfügbar. Der Inhalt wird in der Standard-Sprache dieser Website angezeigt. Sie können einen Link anklicken, um zu einer anderen verfügbaren Sprache zu wechseln. For the German community it has become a habit to do so-called „tasks of the week“—a common mapping effort with a specific topic like turning lanes or pharmacies. This time we are going one step further—a task for the summer holidays. Mapping guideposts along hiking or bicycle routes. Due to its inherent complexity—guideposts are usually spread over a large area and are not as easy accessible as other objects, the task was divided in two parts. 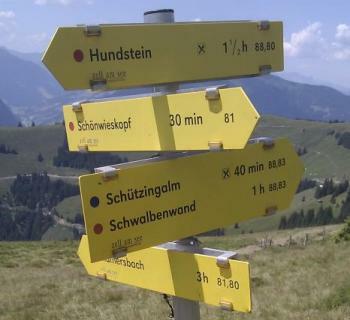 First, mappers are asked to take pictures of guideposts during their summer holidays—a time that many people spend doing hiking or biking tours with their families. The actual mapping of the surveyed information will take place in early September, when people are back home. To refer to this task in blog posts and changeset comments the hash tag #OSMWA1536 can be used. time=* – The time to destination indicated on the sign. The format is „HH:MM“, giving both hours and minutes.